First, boil water for your noodles. I love these ancient grain noodles by Tru Root. They are gluten free, and keep the same nice texture of regular flour noodles, unlike a lot of the wheat and gluten free options. 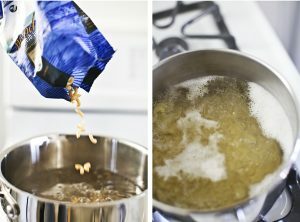 Dump noodles into boiling water and follow instructions on the bag for your noodles. Cook until al dente – this brand takes between 3-4 minutes. Drain and place your noodles into an oven safe bowl. Add 2-3 Tbsp. of truffle oil directly to your noodles and mix in evenly. In a separate bowl crack and whisk your eggs. Then add at least 1 cup of whole milk and generous fresh pepper to your eggs, and whisk. Shred your cheese – the entire 8 oz. block. 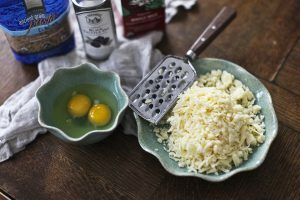 Pour in your milk and eggs to your noodles, and sprinkle on your cheese. Mix in evenly. Preheat oven to 350° and cook for 35min. I like for my cheese to be a little crispy on top, so I cook covered for 20min., and then uncovered for 15min. 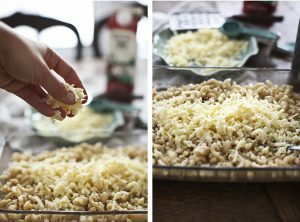 You can always add more cheese. You can never have enough cheese- right? If you want to make it absolutely sinful, use heavy whipping cream instead of milk. “But I want mine creamy like the box kind.” First, put that – preservative filled, who knows what that powder stuff is made of- box down. 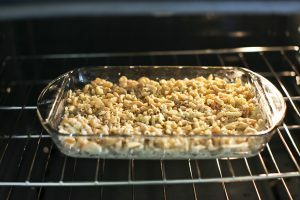 Second add about a 1/2cup more cream or milk and cook covered for the duration of your M&C’s oven time. More truffle you say…pour it on! !